For several years I have toyed with the idea of hosting an event that combines painting (with me as the instructor), and surfing. My dream was fulfilled this October in Nicaragua at a fabulous stretch of beach known as Popoyo. 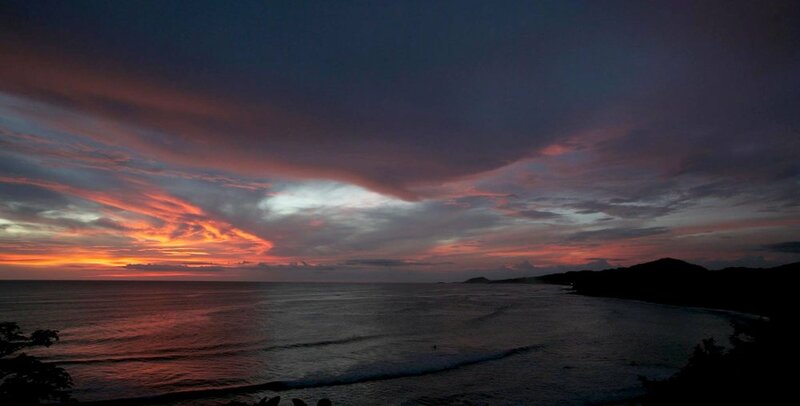 The Popoyo Surf lodge, established in the late 1990s, was our base of operations. Their experienced surf guides, with a fleet of trucks and boats, daily introduced us to a variety of surf. Our group of about 10 people made up a wide range of surfing ability. From beginners who actually learned to surf at the retreat, to skilled surfers after Popoyo's famous barrels. This part of Nicaragua has an amazing climate. Fairly dry on many days, due to the offshore winds that blow consistently as a result of the "lake effect" (Lake Nicaragua, a very large body of water, sits just east). Some days felt like California during a Santa Ana with offshores grooming the waves to perfection. Of course not everyday was perfect since we were there at the tail end of the rainy season. But we were able to surf fun waves everyday. The average wave height was about chest to head high with overhead surf for the more experienced. The water temperature was around 83 and the air ranged from 80-90. Popoyo Surf Lodge provided a large, air conditioned recreation room which became our art studio. People were so into their painting that they worked at all hours of the day and night, crafting beautiful ocean scapes with new found skill, experimenting with the new techniques that they were being taught. Everyone took home a number of paintings, that both they and I were proud of! Some of the artists did some outdoor painting as well. We also had a number of guests of the lodge as well as workers who would sit for portraits and figure painting. All guests found the accommodations very comfortable. We slept in private, air conditioned casitas. We were served 3 meals a day and the food was great. The bar was popular late night gathering spot to discuss art and let off steam. Many of our surfer/painters became fast friends. Even though we had painters from all over the U.S., I anticipate they will stay in touch. Many are asking about when and where the next SURF & PAINT will be. I hope we can return to Popoyo, and we have been invited back. I am currently working on plans for a local (North San Diego) weekend SURF&PAINT for early Spring 2017 and will keep you all posted. I love to teach painting. Most of my students are beginning to intermediate painters. I teach oil and acrylic painting. The workshops are held in various places in North San Diego County, usually in the evenings (except for plein air workshops) and sometimes on weekends. Most of my workshops are what I call “Introduction to Landscape Painting”. This is an easy format where I select photographs as reference for the students - photos that have been taken by me and proven to guide the artist to a solid and thoughtful composition. The classes are generally no more than 8 or 9 people (often smaller). Our Plein Air workshops are held in spots in North SD County, scenes I have often painted- places that are easy to get to, although “off the beaten path”, where we won’t be inundated with on-lookers. In these tranquil settings we work on “painting from life”, how to SEE the landscape and create from it an inspired sketch. The emphasis is on COMPOSITION, COLOR and VALUES. The current schedule is on our website in the “News and Events” section. Shoot us an email or call us if you have any questions. I have done dozens of surfboards sold mostly in art galleries in Hawaii. I do quite a few custom commissions for local collectors, as well. Our boards are delivered with an automotive “gloss and polish” finish and a built in hanging system that can be easily hung from picture hooks on your wall. My most popular motif is what I call the “Polynesian Collage”. This is what you see in many of the examples shown here. But the collage format can be adapted to other subjects and places. I also do complete scenes of a place. We work with our collectors to offer a variety of types and sizes of boards. We offer wood surfboards in addition to fiberglass boards. The process usually takes 6-8 weeks. If you are interested in an art surfboard for your home, email me at wade@koniakowsky.com to schedule a consultation. I paint many subjects. I paint on location when I travel, such as my recent trip to South Dakota. I just happened to be there for a family reunion and had brought along a portable set of gouache paints (water-based “sketch” paints similar to water color). I also paint tropical wavescapes and tropical locales such as Hawaii and Tahiti. But because I live in San Diego, I always go back to painting this area, mostly the coast. Our gallery in Solana Beach, CA called Ocean Art is filled with paintings of the San Diego Coast. Many of our collectors want significant (larger) works of their favorite beaches in the area they call home. In fact, it is my goal to fill my gallery with as many depictions of the San Diego coastline as possible. The iconic and the less popular. I want our gallery to be the world headquarters for oil paintings of the San Diego Coast. This area never ceases to inspire me to paint. Good light year round, beautiful beaches, a variety of terrain, interesting foreground, middle and background elements, all make San Diego a memorable subject. If you’re in the market for a San Diego scene or a reproduction on canvas, please drop by and take a look at our gallery. Why do I paint “Plein Air”? Plein air is a French term for painting outdoors. Literally “in the open air”. Some of the first artists to adopt this approach were the French Impressionist painters of the late 19th Century. Another term synonymous withplein air is “painting from life”, although this term can apply to painting still life’s or painting the human figure. All of these terms stand in contrast to painting from photographs. Painting from life, or painting outdoors is, quite simply, the best way to SEE THE SUBJECT your painting. So what’s my method? I use anything I can. When I can go outdoors and see the landscape in natural light, I will. But to meet the demands of my market and do larger paintings, I spend more time in the studio. When I am in the studio, I am referring to PHOTOGRAPHS, SKETCHES, and smaller studies, all taken from the outdoors and then translated indoors, to create larger studio paintings. So, while I do occasionally sell field studies (smaller works done on location), they mainly serve as the inspiration and guide for larger studio works. Wade will take you through the fundamentals of landscape painting from photos of popular North San Diego scenes. Materials: Bring your own oil or acrylic paints, brushes and canvas. Easels will be supplied. Full supply list available on request. Wade will take you through the fundamentals of painting a North San Diego scene on location, outdoors. Materials: Bring your own oil or acrylic paints, brushes and canvas and easel. 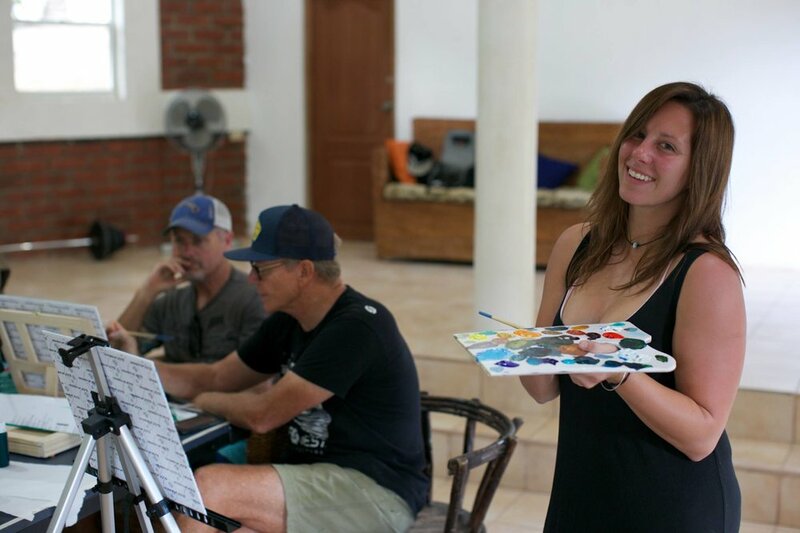 Join Ocean Artist Wade Koniakowsky for week - long painting and surfing adventure at Popoyo Surf Lodge, Nicaragua, October 29- Nov 4, 2016. 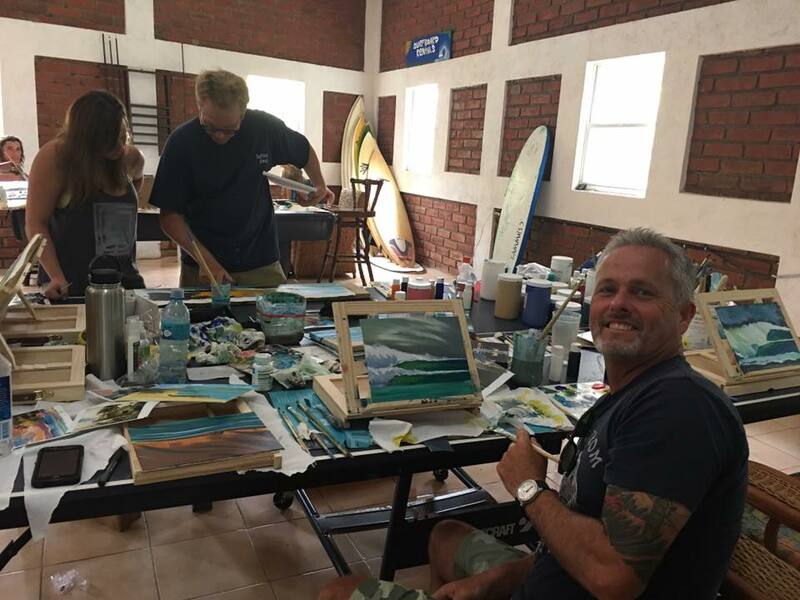 Wade will go in depth to teach you techniques to hone your painting skills in the lush color of the tropics. Paint beautiful beaches and perfect waves everyday - all art supplies are included. Download the PDF, complete details, and then secure your spot with a $275 refundable deposit. 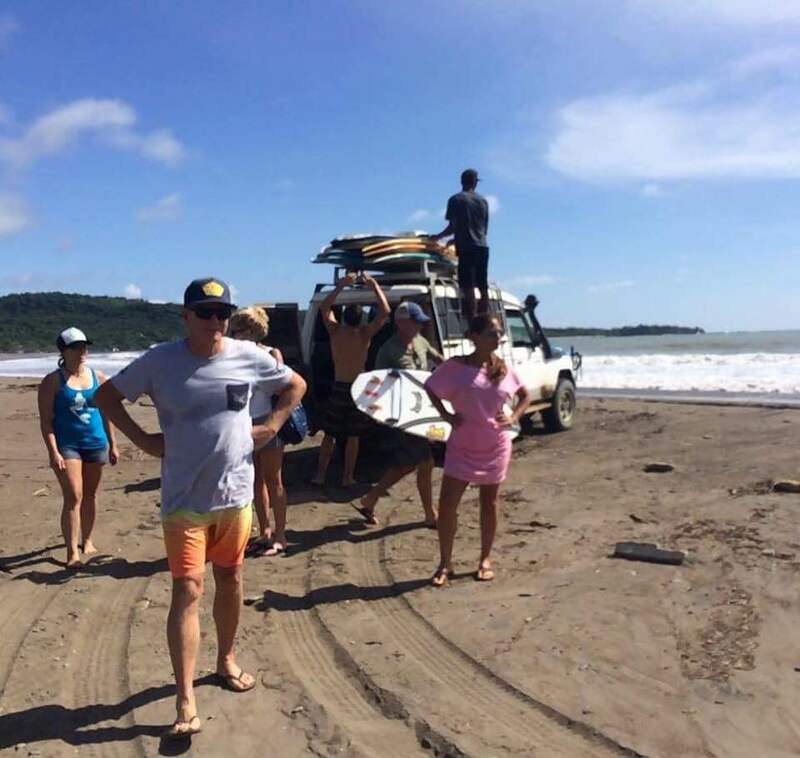 Email Popoyo Surf Lodge at surfnicaragua11@gmail.com for info.